Tam Dao is the name of an area which houses the three mountains of Thach Ban, Thien Thi and Mang Chi in Vinh Phuc, Thai Nguyen and Tuyen Quang provinces which were formed 230 million years ago following a volcano eruption. Tam Dao, though, is mostly situated in Tam Dao Town, Vinh Phuc Province, around 90 kilometers from Hanoi and is suggested as an ideal getaway for tourists. During the summer, people rush to Tam Dao which is considered the Dalat of the north with its fresh cool air, mist and romantic scenery. The area is in the shape of a hollow valley with a stunning mountain called Nha Tho (Church) which takes your breath away. In 1902, the French discovered the 253-hectare valley at a height of 900 meters above sea level which has four seasons in one day. They started to turn the valley into a tourist area for officers to relax. The French built around 150 magnificent villas with sports services, discos, swimming pools, restaurants and churches along the windy roads. There is also an old stone church which stands at the foot of the mountain. Built in 1906 as a stilt house, it was rebuilt in 1937 with brick and stone. It’s Gothic in décor and emerges imposingly amidst the endless green pine trees and is a striking example of French colonial architecture in the valley. No matter where you stand in the valley, you can see the stone church, especially the bell tower. The church is highlighted with semicircular hard arches for tourists to sit under to admire the romantic town. 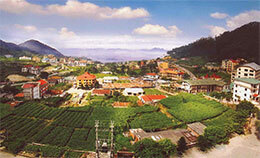 Tam Dao is also home to the fruits of chayote and banana. In Tam Dao, tourists love the thrill of experiencing the four seasons with the cool climate of spring in morning, warm summer at noon, romantic chill of fall in the afternoon and cold winter at night. Moreover, from the center of Tam Dao Town, tourists can trek down a deep valley where Bac Waterfall is tucked in the mountain’s heart. Stepping down around 300 stone steps, visitors will see the white carpet under the golden sunlight.